With fascism and nationalism beginning to take hold in a handful of western nations, two idealistic Oxonian poets realise their lifelong dream of traveling to Iceland, and publish an interdisciplinary travelogue comprised of poems, letters and archival anecdotes. No, this isn’t a crowdfunding pitch for bougie millennials seeking to curate their excursion to the Land of Ice and Fire in a ground-breaking multimedia volume; rather, it’s the premise of Letters from Iceland, a hodgepodge account of W.H. Auden and Louis MacNiece’s peregrinations through Iceland in 1936. Published exactly seventy years ago in August of 1937, the work has hardly achieved canonicity amidst the rest of the poets’ celebrated oeuvres, and indeed, although the authors inscribed their travels in epistolary verse, much of the poetry is nothing to write home about. The book, however, remains a telling document, both of continuity and change throughout the seven decades that have witnessed Iceland transform from a seldom-visited Danish colony of impecunious farmers into a tourist-swarmed sovereign nation of bankers and trend-setters. Here are three of the most salient observations. Auden was no more complimentary about the rest of his stay in the capital, calling it “the worst possible sort of provincial town as far as amusing oneself is concerned.” Bored by Reykjavík, Auden wrote, “there was nothing to do but soak in the only hotel with a license; at ruinous expense.” Today, of course, there’s no shortage of activities and happenings around town, but Auden’s blasé attitude is echoed by the common sentiment of contemporary tourists and guidebooks that Reykjavík may be “done” in an afternoon. The financial strain of Auden’s sole urban pastime remains just as palpable today. In the summer of 1936, with the Icelandic Prohibition recently reversed, a whisky and soda at Hotel Borg cost 2.25 ISK, and a glass of decent sherry 1.45 ISK. For those wishing to imbibe on the go, a bottle of brown sherry cost 9.50 ISK, and a bottle of Spanish brandy 6.50 ISK—both of which could be procured “furtively over the counter” in government-run shops. Today, the array of intoxicating potables on offer is slightly broader, but these, too, must be acquired from state-owned Vínbúðin shops. And although the 1936 prices seem a pittance today, they were extravagantly steep to Auden and MacNiece who, by comparison, paid 10 ISK a night for modest accommodation in University of Iceland dormitories. As was the case then, a 700ml bottle of brandy (which can’t be bought for less than 5.500 ISK) could easily cost more than half the price of a night’s stay in a comparably modest private room. One might be mistaken into thinking that the current Iceland frenzy is a twenty-first century phenomenon, spurred on by Instagram shots, airlines’ aggressive advertising campaigns and the international export of quirky, atmospheric pop music. However, Letters from Iceland—itself a product of the authors’ Icelandophilia—portrays a host of others stricken with the same bug. In fact, Auden may well have coined the neologism, writing of a fellow traveller whom he characterized as “a Scotch girl, an English lecturer at one of our provincial universities, and a great Icelandophil.” Curious academics were not the only Icelandophiles Auden and MacNiece encountered; on a number of occasions, they crossed paths with Nazi-sympathizing Germans, and even high-ranking Nazis. While in Hólar, Auden shared accommodation with Nazi ideologue Alfred Rosenberg and the brother of Hermann Göring, who would become the Reich’s Vice-Chancellor. 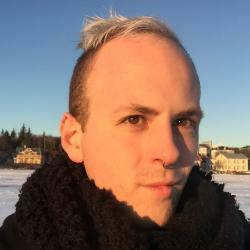 Although now, as then, white nationalists still idealise Iceland as “the cradle of Germanic culture,” contemporary Icelandophilia affects a much broader swath of people; it’s far likelier that you’d share accommodation with an oddball queer kid who loves krútt-pop and analogue photography than with an adherent to genocidal ideology.